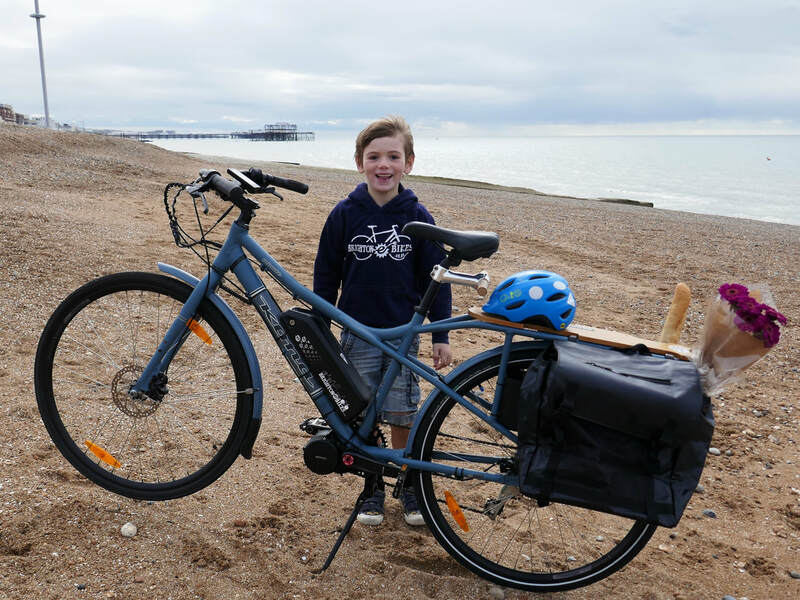 'Kona Minute' Brighton Ebikes edition on the beach near the old West Pier in Brighton. 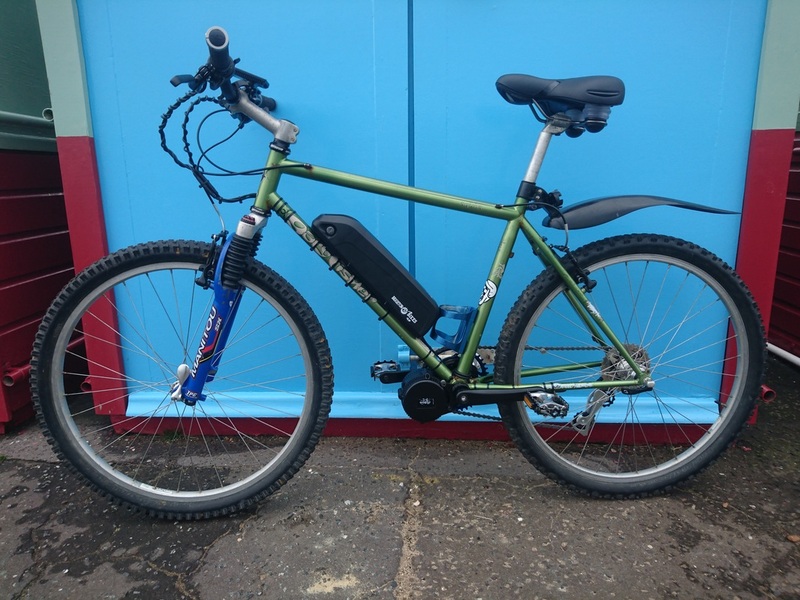 Fitted with Bafang BBS01B 36V 250W mid-drive motor and a Samsung 30Q cell 540Wh battery pack. Delightful! Of the hundreds of conversions I've now performed, I rarely take before or during photos leaving the photoshoot solely for the completed job; a selection of which can be viewed in the website gallery. 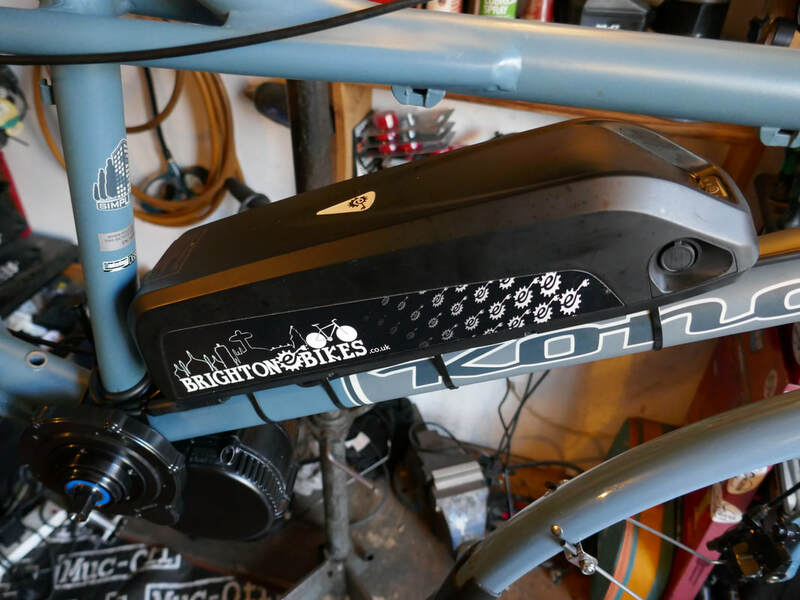 So, whilst a short video of a complete Brighton E-bikes installation is on the cards, below are some photos taken during a recent conversion of a 'Kona Minute'. 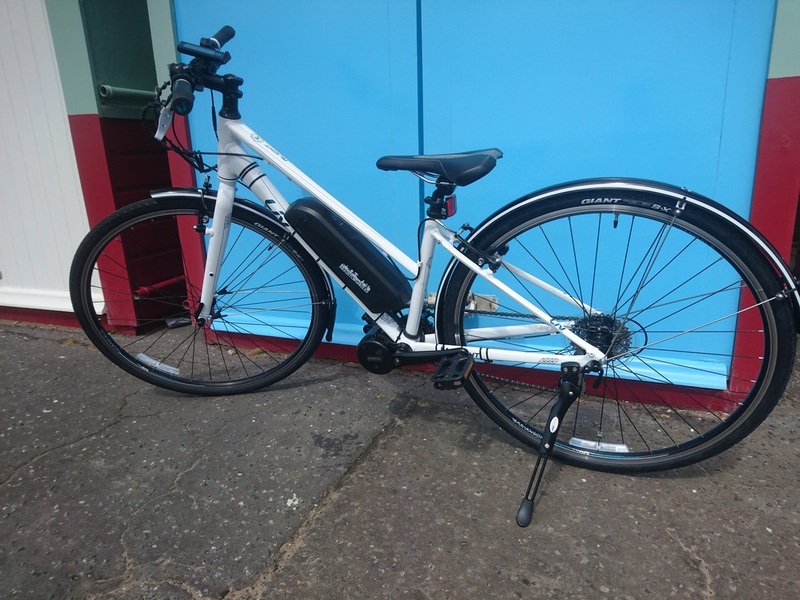 This little beauty is to be our family school run / shopping / errands transport; a true car replacement for local journeys and is just perfect for the job. 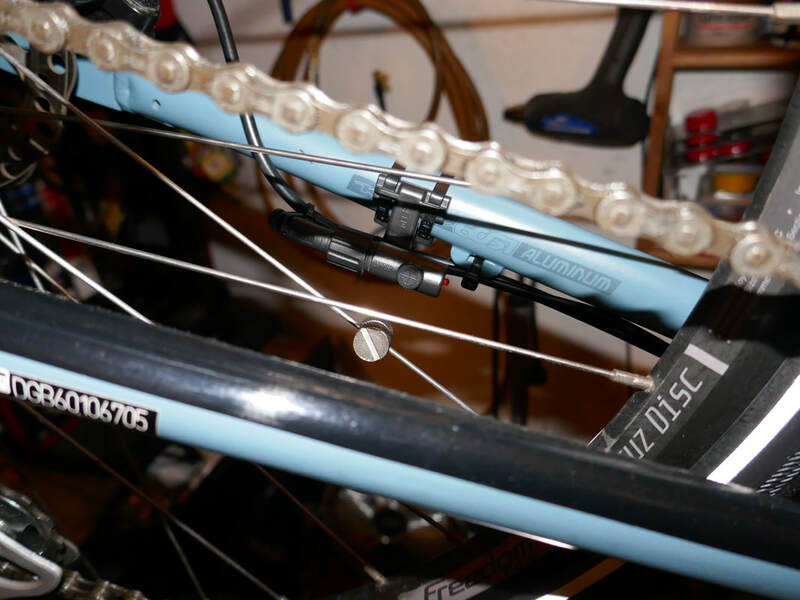 As the Bafang BBS01B motors run a single chain ring, the front derailleur will no longer be required, so that goes and the chain is removed for a clean or replacement depending on the level of wear. 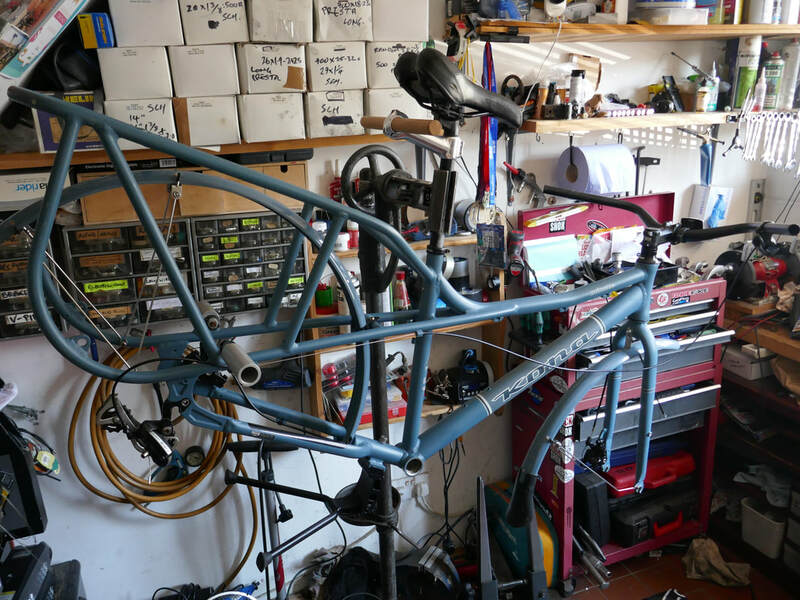 In the early stages of the strip-down with the cranks, bottom bracket, chain and front derailleur removed. Ready for a clean up. 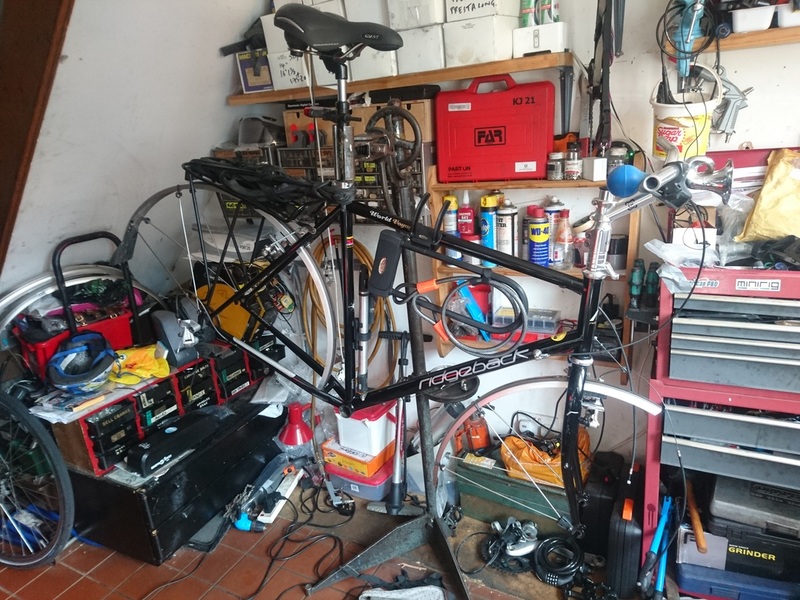 Wheels off, handlebar grips, brakes and front shifter are removed leaving only what will remain in place for the build. 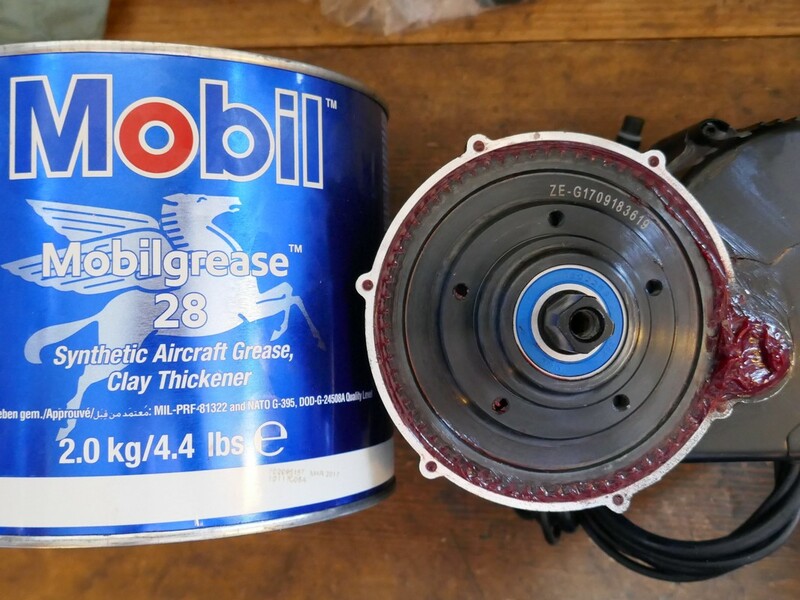 There is little point in not taking the opportunity to give the bike a good degrease and clean, especially the transmission, so a thorough clean and lube is performed before proceeding any further. 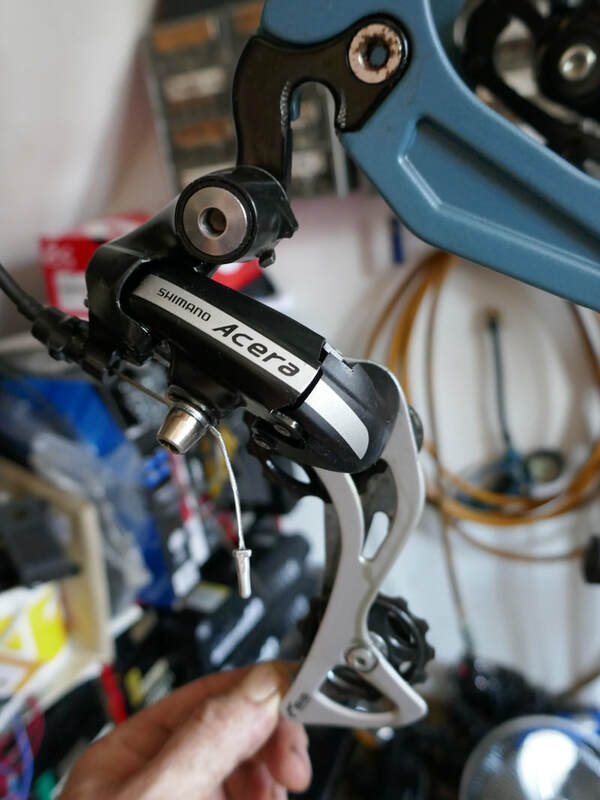 Here, the rear derailleur is transformed to a like new condition. 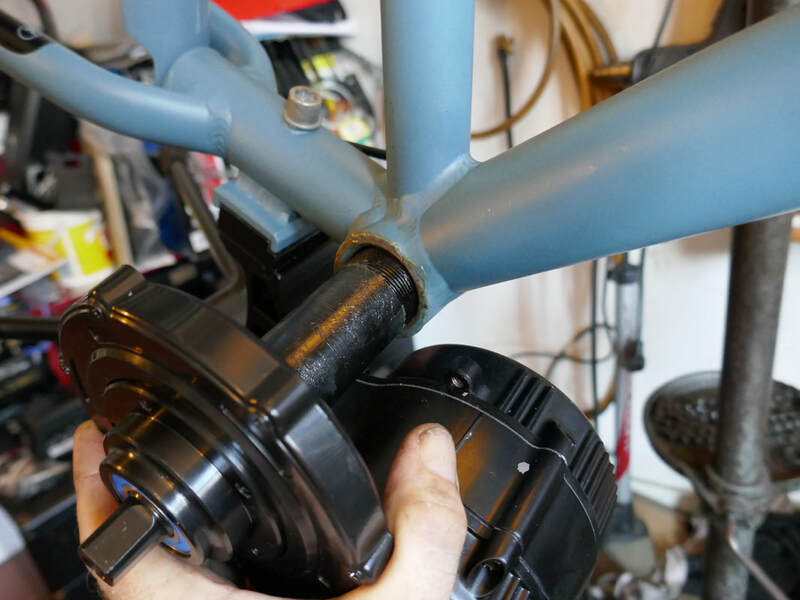 The motor is then offered into the frame and set in position, ideally close to the underside of the downtube. 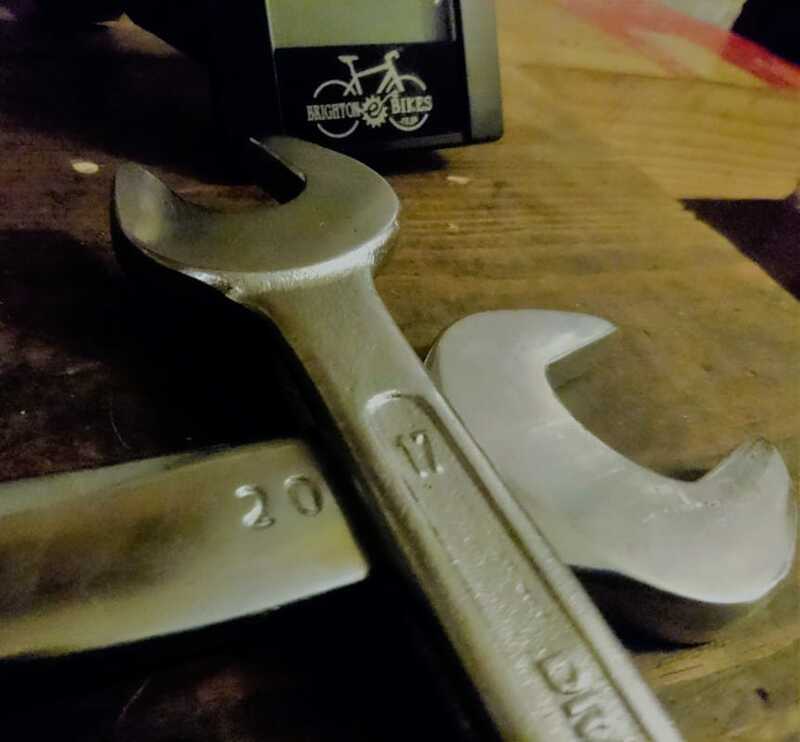 The correct tools for the job. 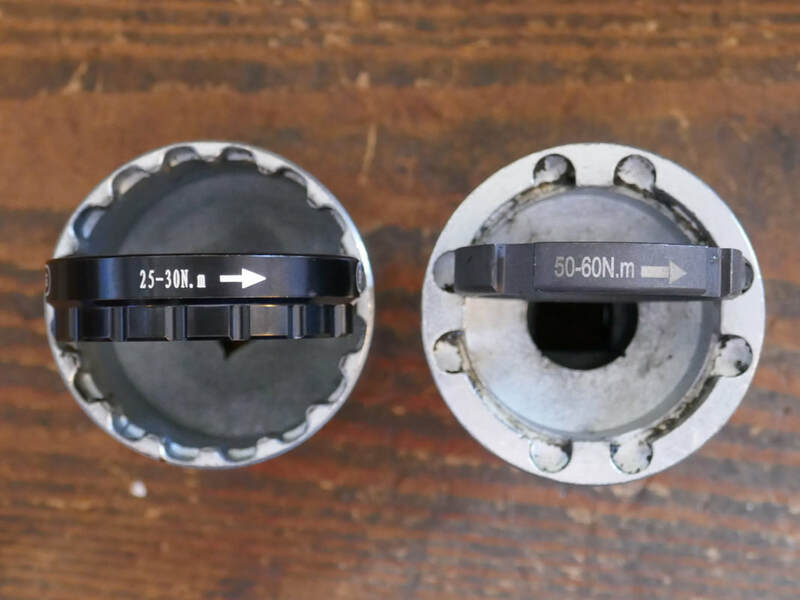 The Bafang securing nut and lock ring will be secured to the correct torque levels using specific sockets and of course a torque wrench. 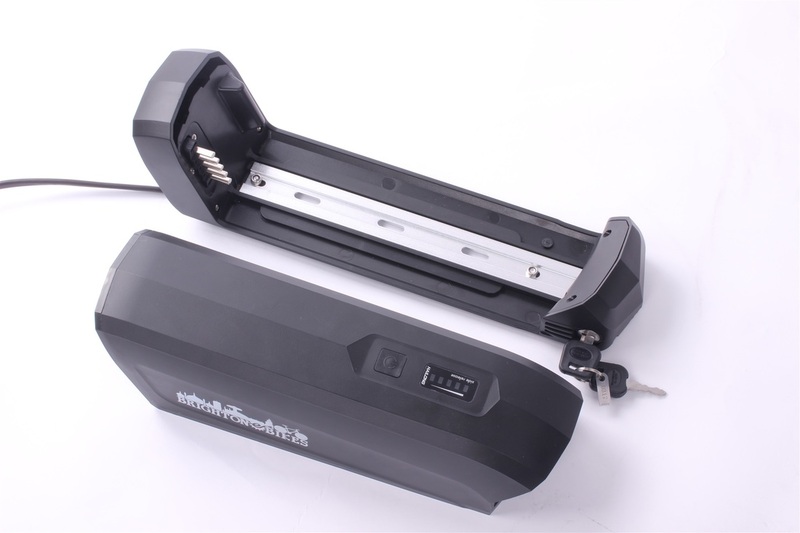 The retaining plate is positioned with the raised face inwards to contact on the bottom bracket, then the main M33 4-notch securing ring is fitted followed by the lock-ring to the specified torque settings of 50-60Nm and 30Nm respectively. 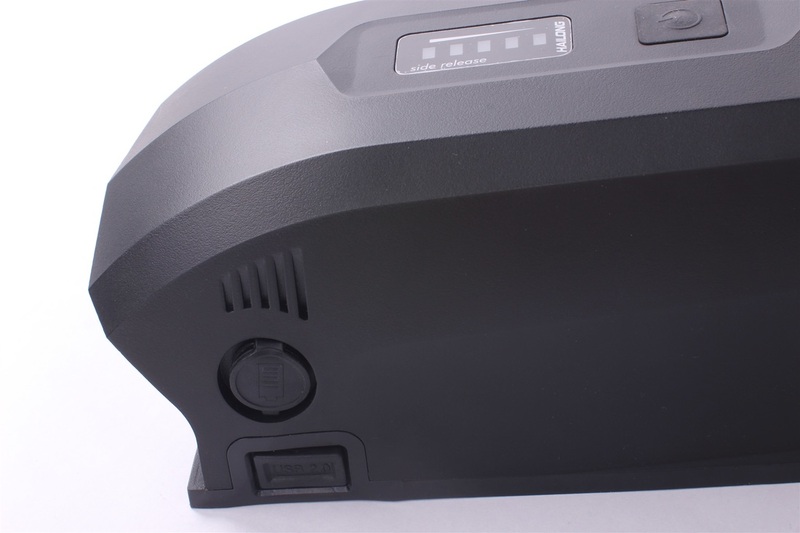 With the motor now secure, attention is turned to the battery mounting. 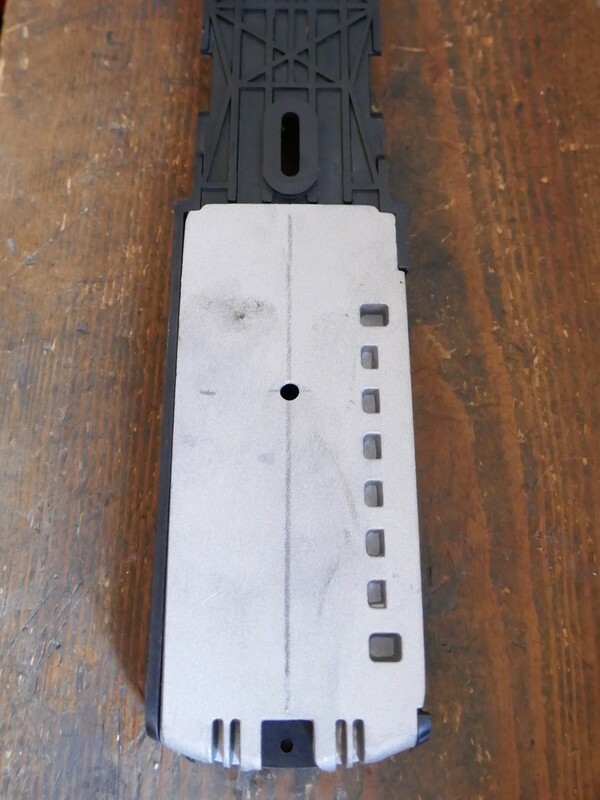 First, a hole is drilled in the centre of the metal base plate. 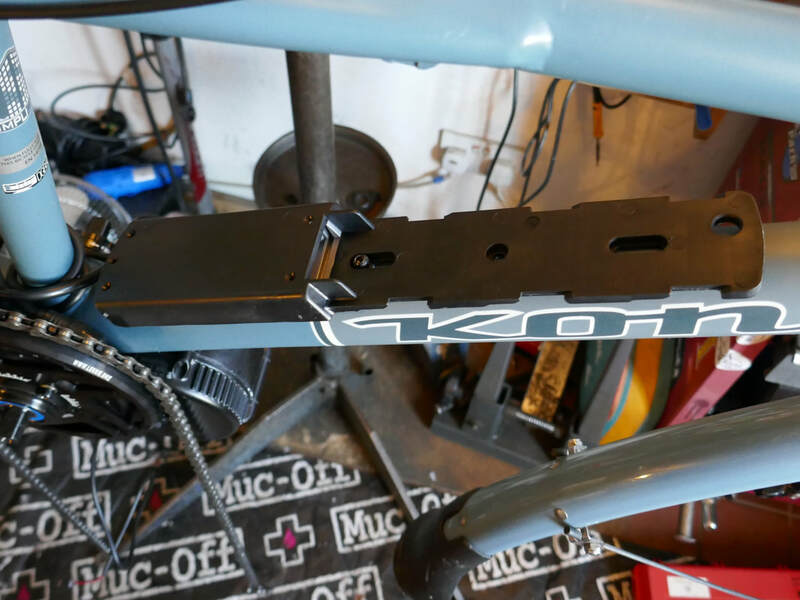 This will become the lowest most mount point. 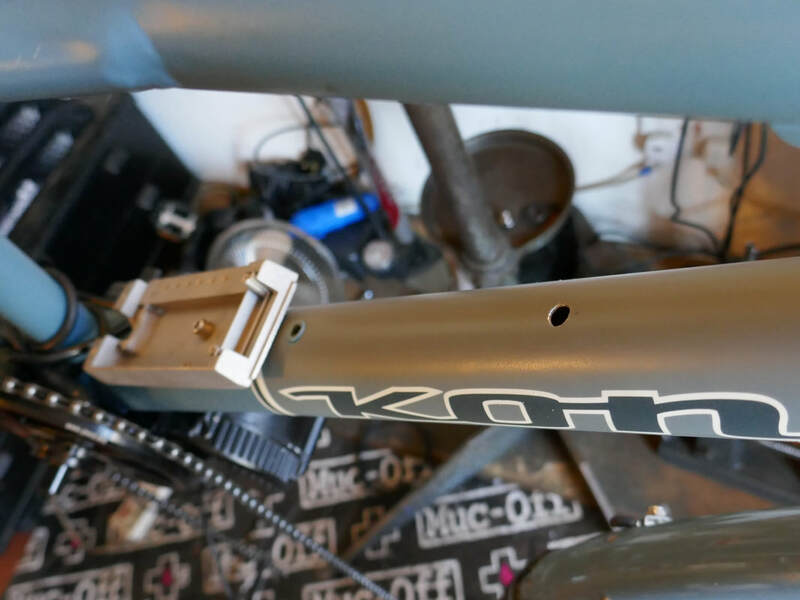 The metal base plate is fitted to the frame with stainless steel M5 bolt, split washer and thread lock. 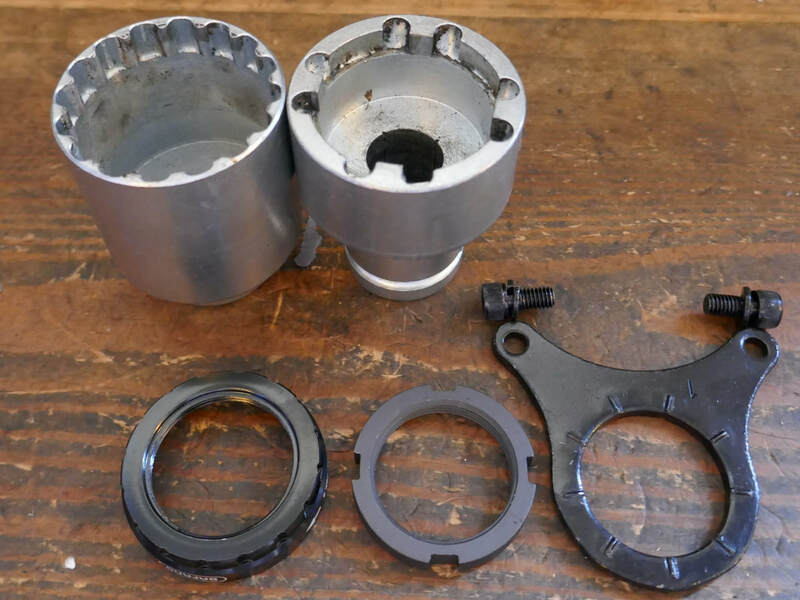 The top section of the battery mount can then be offered up in order to measure where the additional rivnut needs to be fitted. 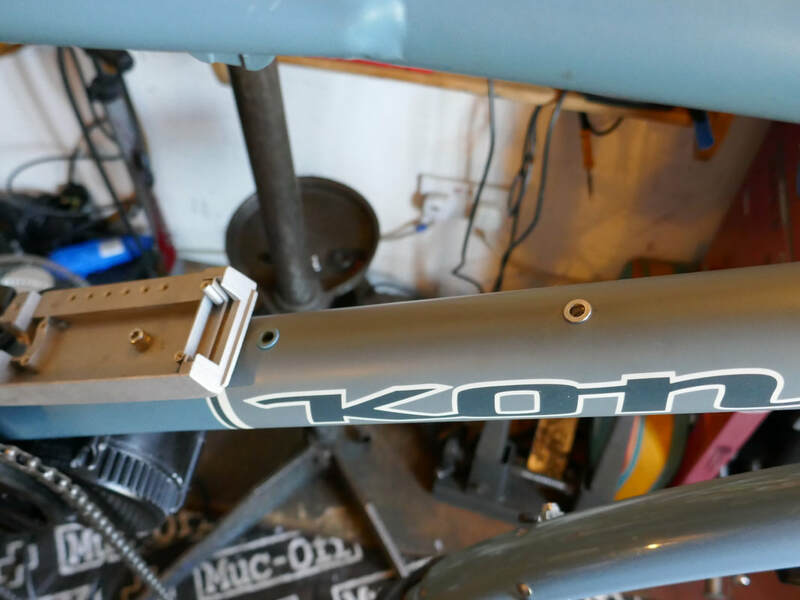 With the exact position carefully marked with a centre-punch, the hole for the rivnut is drilled in the frame. 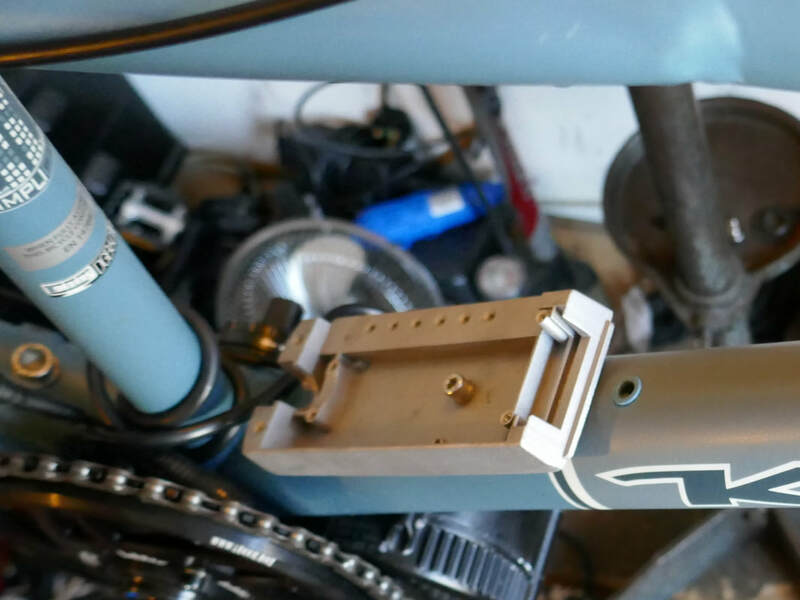 The rivnut is fitted and the main section of the battery mounting plate installed. 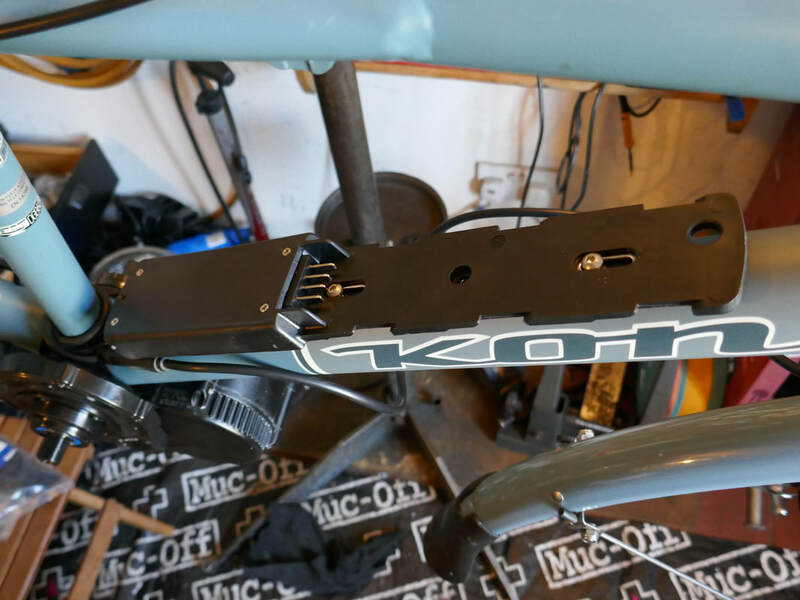 Motor and battery installed, check! 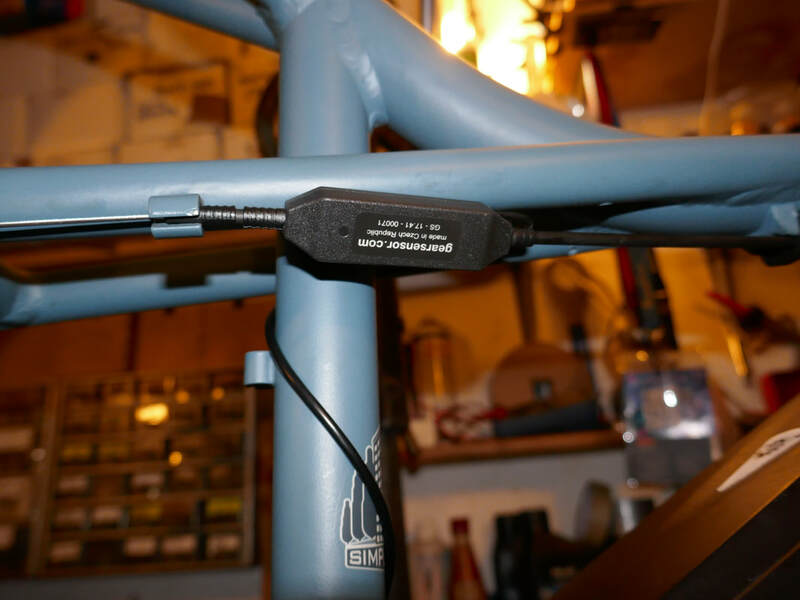 The main wire harness is run along the downtube on the underside of the battery mount before being connected to the handlebar display and power controls. 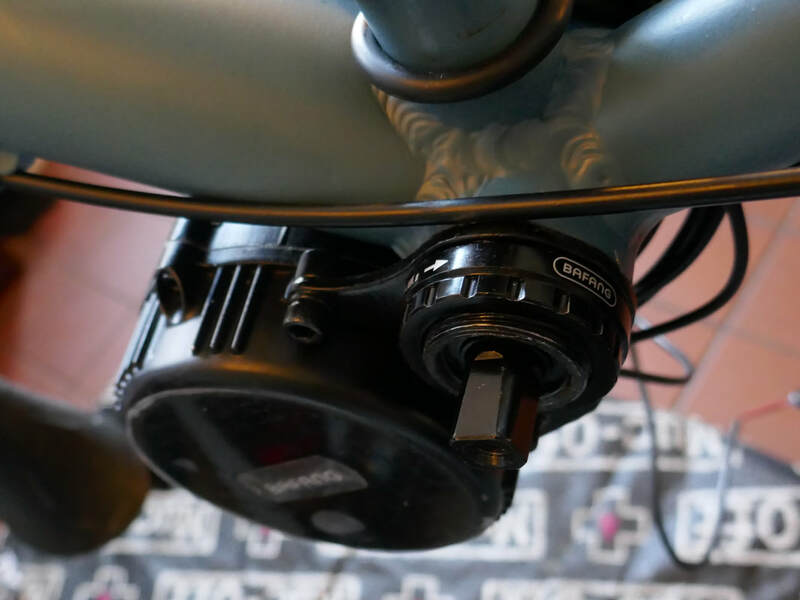 The speed sensor is mounted along the underside of the non-drive side rear stay and magnet fitted to the wheel spoke (opposite to valve for balancing). 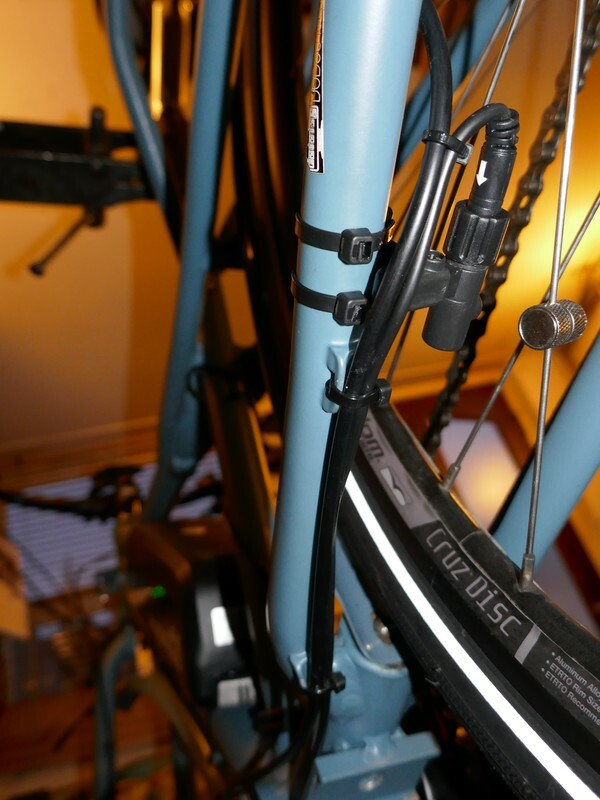 The gear sensor (from gearsensor.com) is fitted inline on the gear cable. 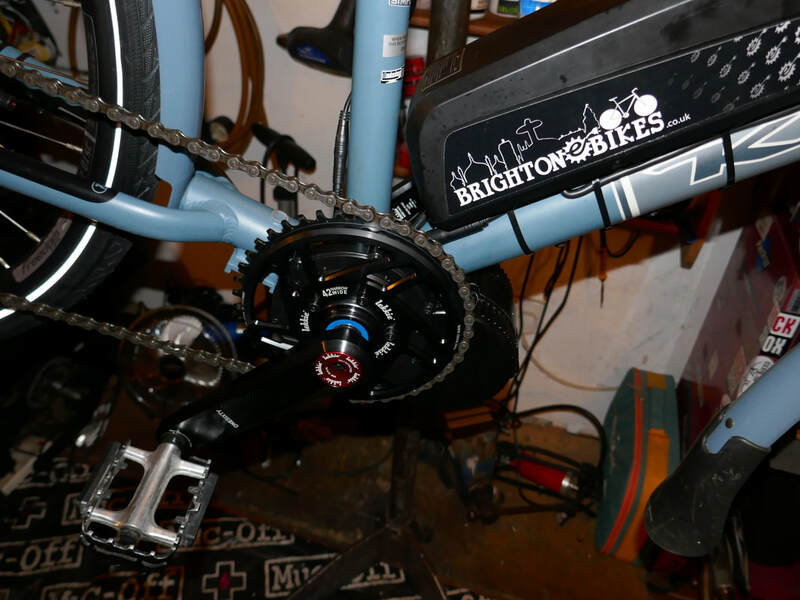 Lekkie 42 tooth chainring and Buzz Bar crank arms are installed to the correct torque settings. 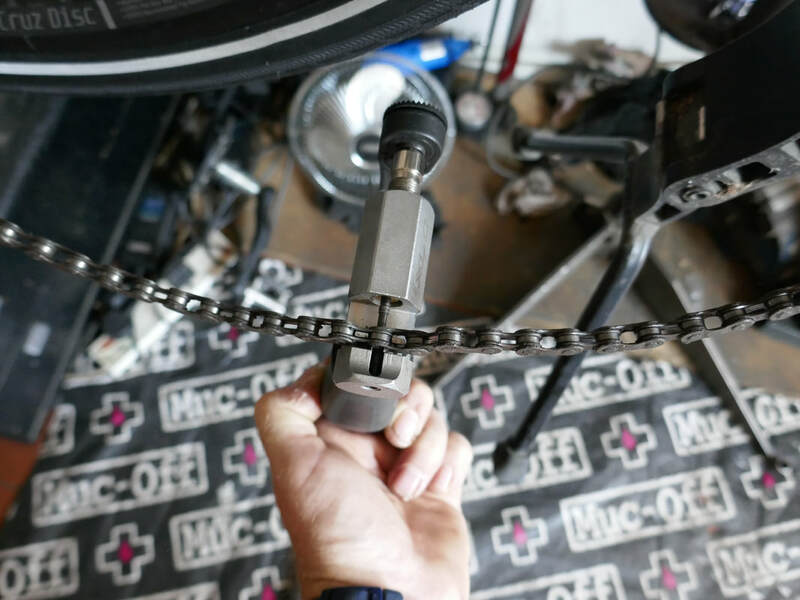 ​The chain is then refitted checking the length is correct. Although brief and omitting to detail a number of stages such as the cable soldering / heat shrinking, display setting and controller programming, it's a far better log of a conversion than I have kept before. 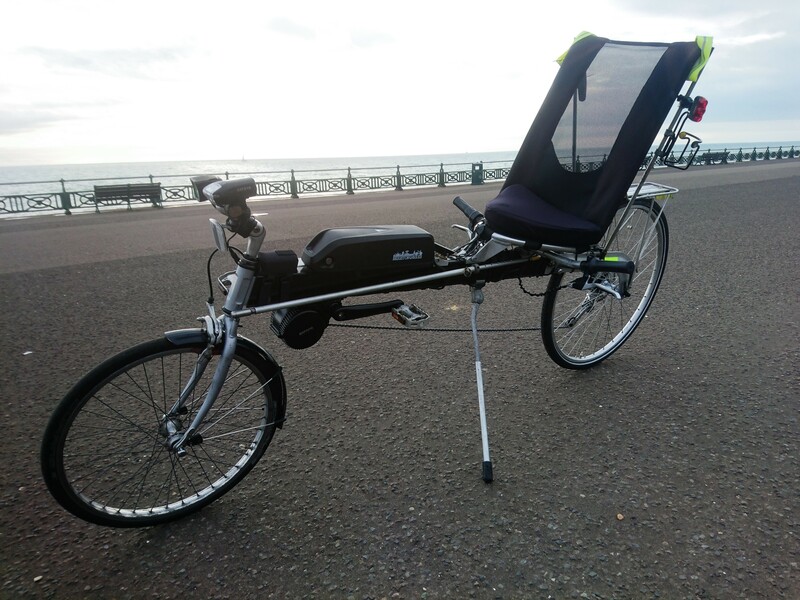 A quick road test down to the beach and back, followed by any fettling or slight programming changes back at the workshop and it's pretty much ready to go. 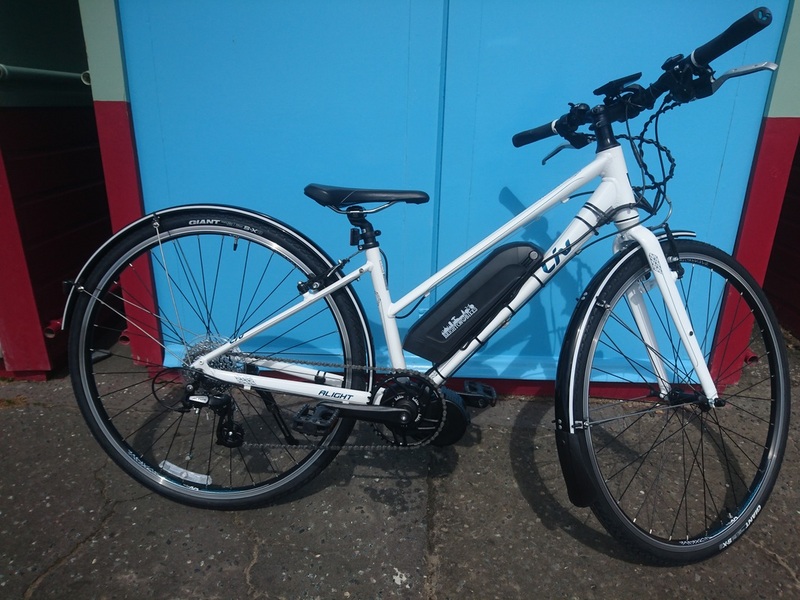 So here it is, the 'Kona Minute' Brighton Ebikes edition all ready to provide daily service as a true car replacement for local journeys and much more. 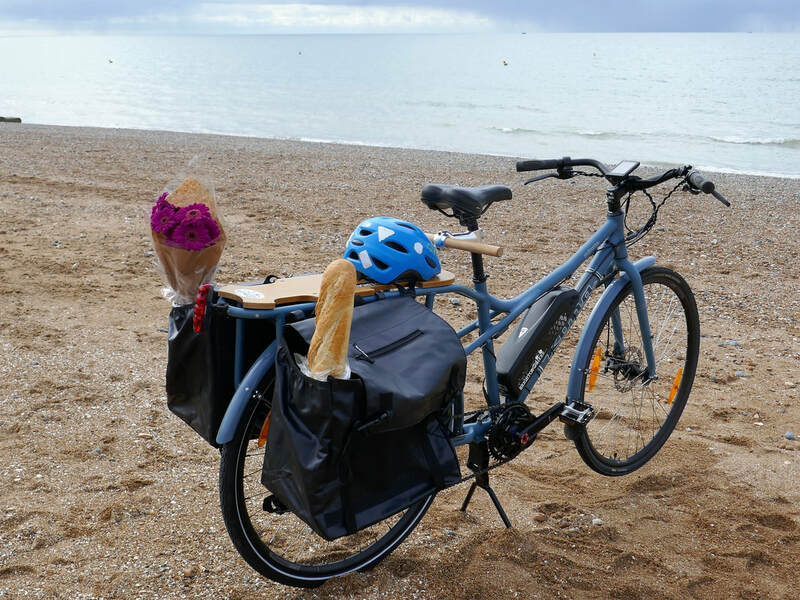 It's already loaded with child, panniers full of groceries and some flowers for the wonderful lady who keeps us two in check! 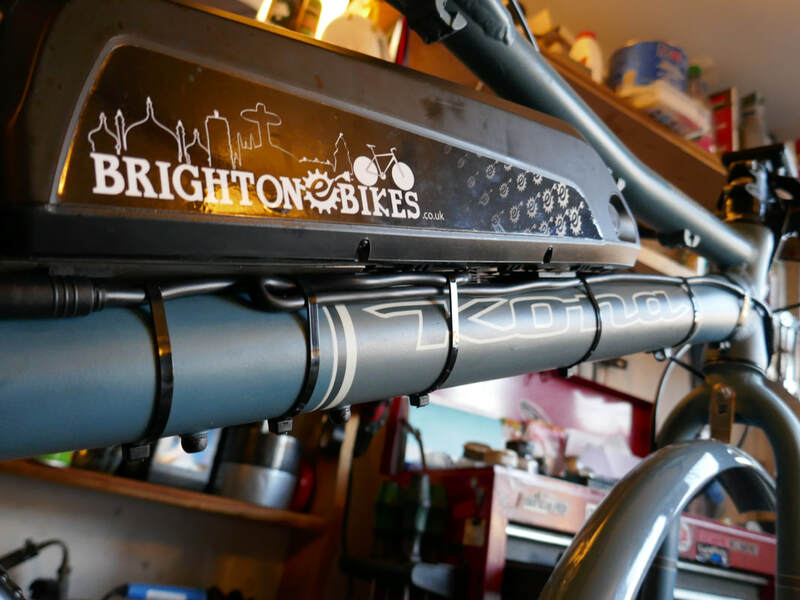 Since early 2017, Brighton E-bikes has shared a lot of updates and other useful/interesting content via our Facebook page. 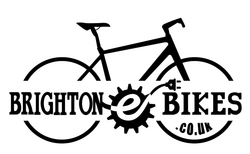 ​Please click on the Facebook logo below to link directly to our Facebook page. ​And why not click on the 'LIKE' button on our Facebook page to follow our future updates. 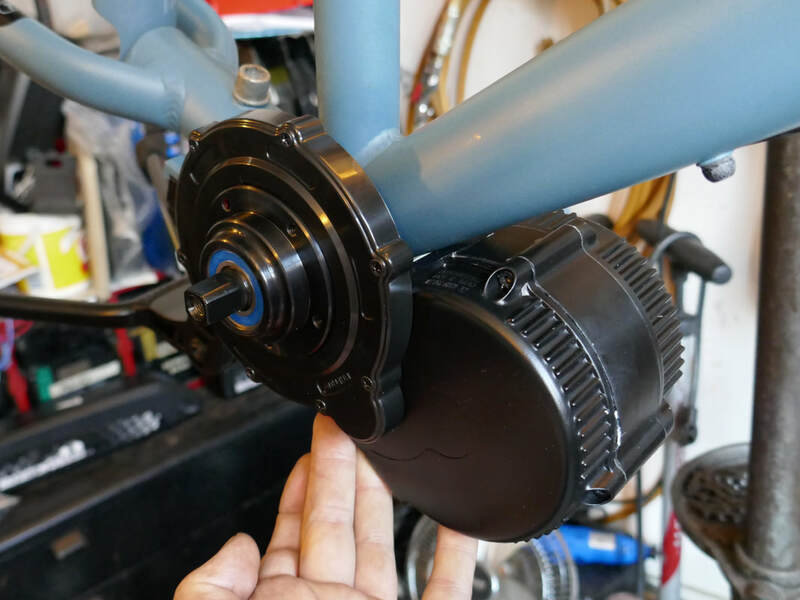 Yet another reason...... why we love the Bafang BBS01/02/HD motors. 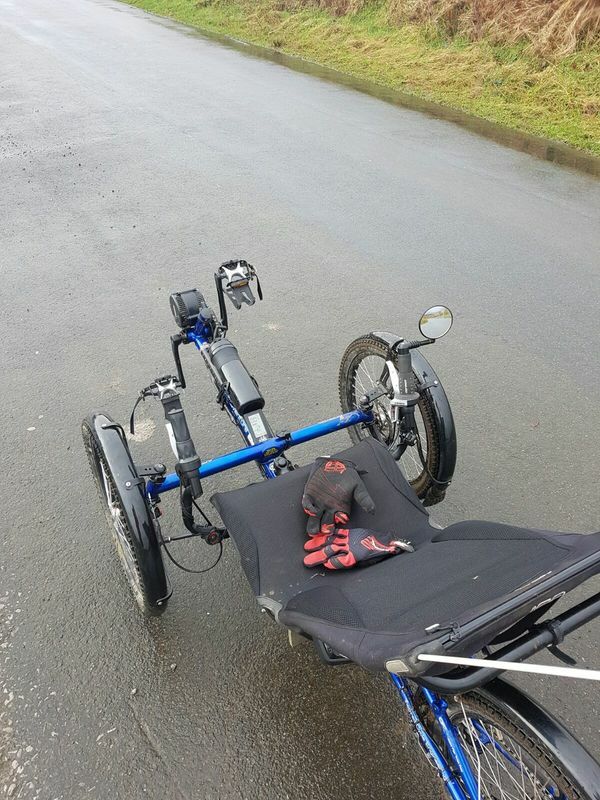 We were recently delighted to be able to help an ex-serviceman, who uses a recumbent Ice Trike for off-road fun and exercise. 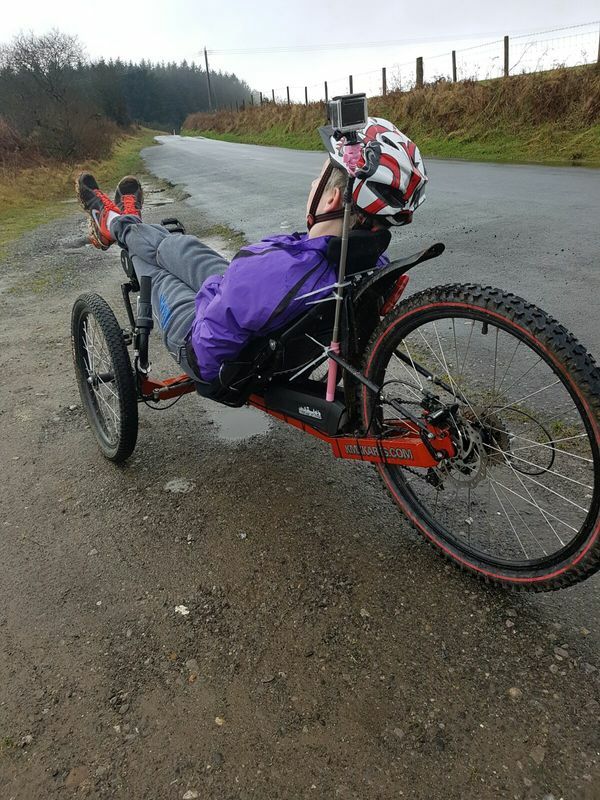 Since becoming a double amputee, he'd mainly been riding the trike along local fire roads, but quite understandably, found the dead-spots in the pedal stroke a real chore. 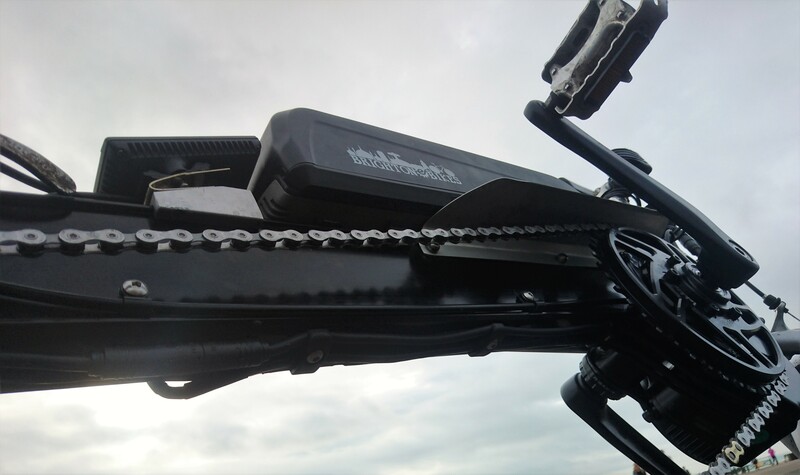 He would tolerate the discomfort in order to get out, get exercise and have fun, but now, thanks to the wonders of these little crank motors, it doesn't have to be that way! 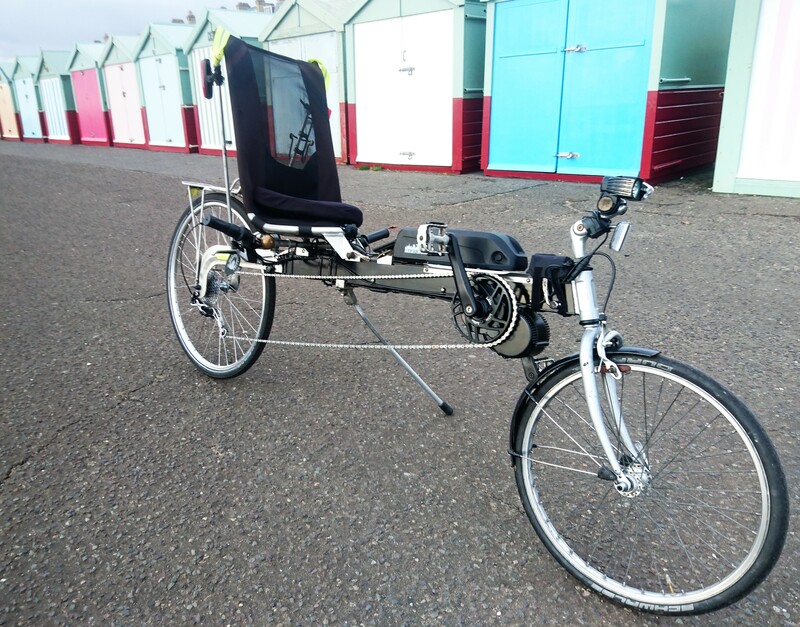 A fair bit of alteration was performed to adapt the motor kit to deliver the best possible results, but we're really happy with the outcome, and he seems to be putting in the miles getting used to his new toy. 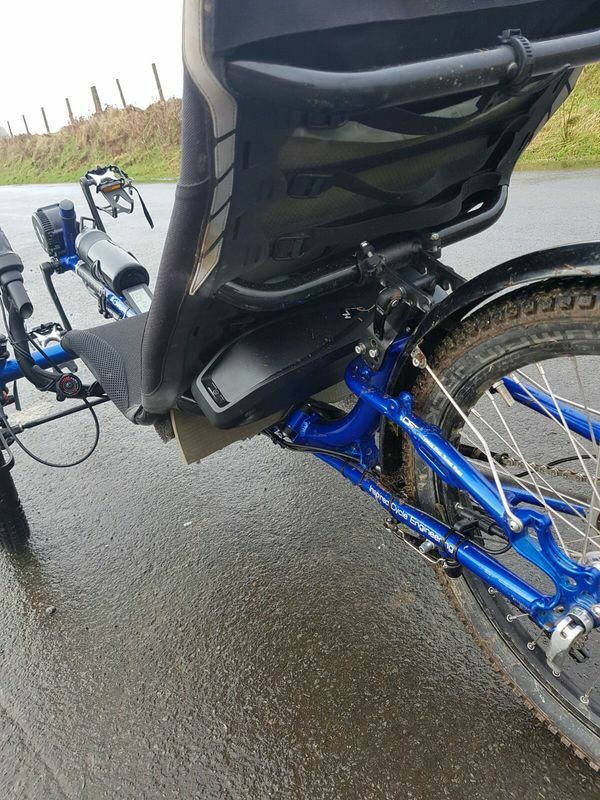 We converted his wife's KMX trike too, and now their rides take them far further with more smiling and less grimacing . 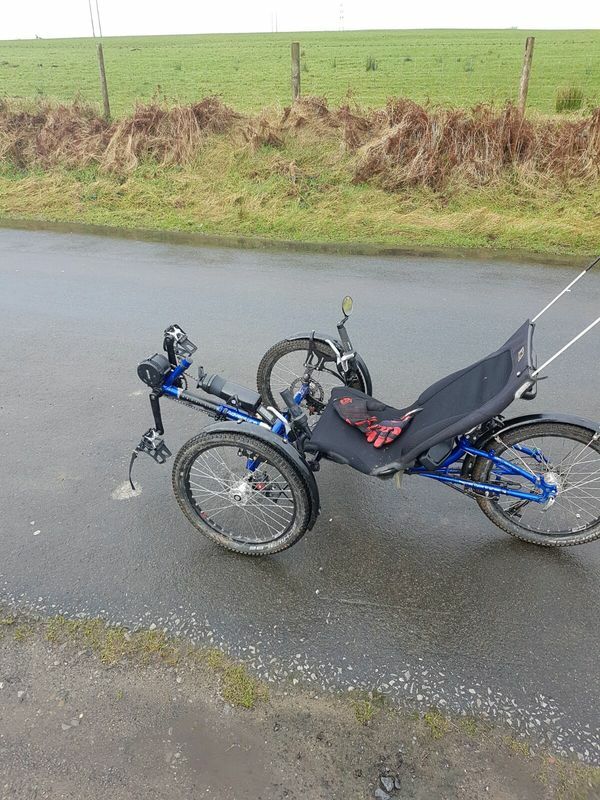 He only seems to use the assist on the uphills, reducing the assist to 0 once through the gritty part of the climb, where his lack of full pedal stroke would make maintaining speed a little too much. It's one thing getting a little help on the commute, quite another when life as you know it is taken away from you. 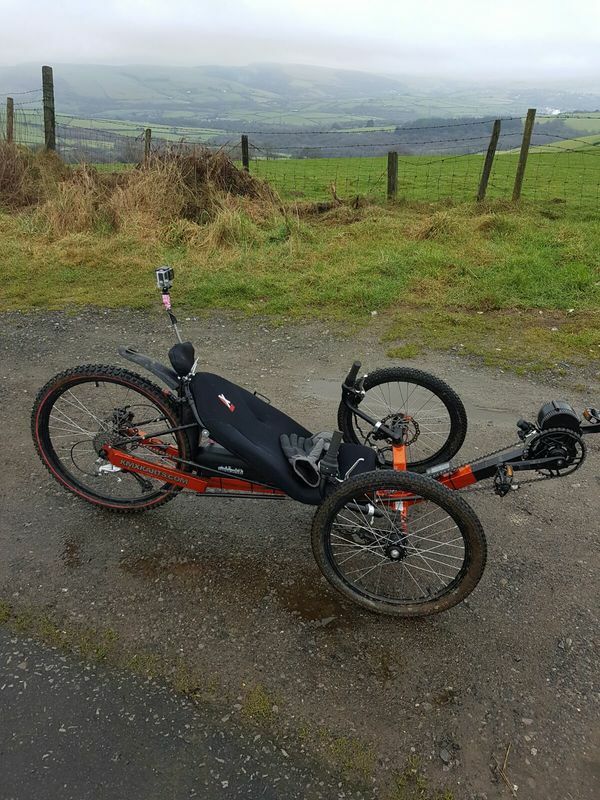 Here's a few snaps of them out and about in the glorious Welsh countryside. A sure case of more smile per mile. 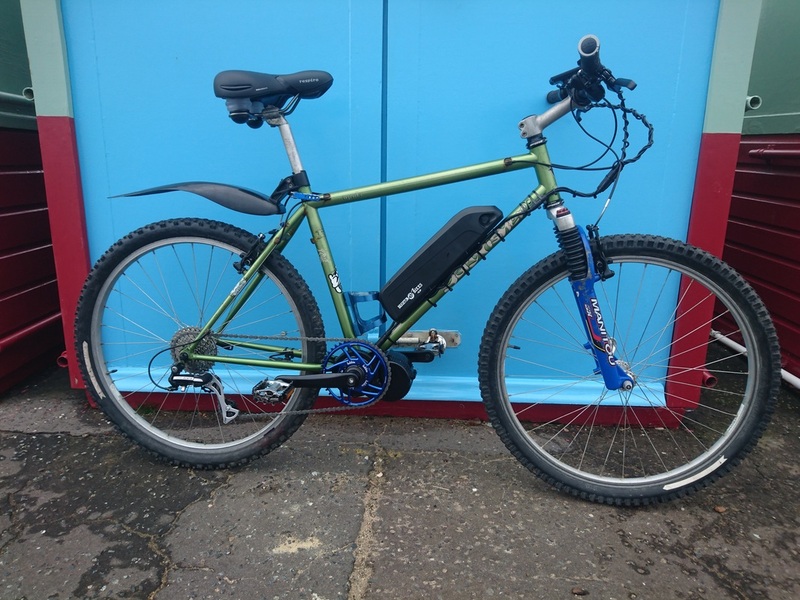 Designed by the owner, primarily to be able to drop his son off at nursery then commute 20 miles on to work in one time saving motion, this BMC Alpenchallenge AC01 is a small person mover that transforms into a commuter rocket. 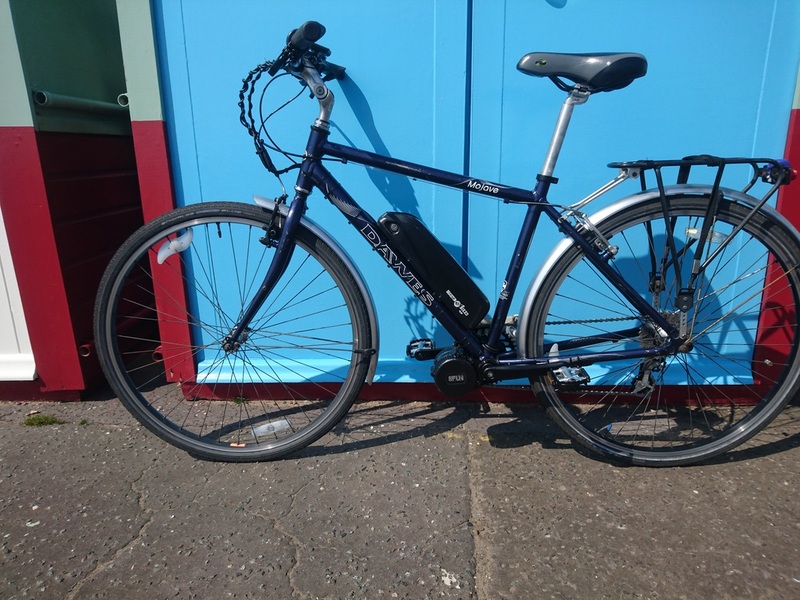 Leaving both child and childseat at nursery just 2 miles into the journey, it's then into sports mode to tackle 20 miles of London roads to get to work. 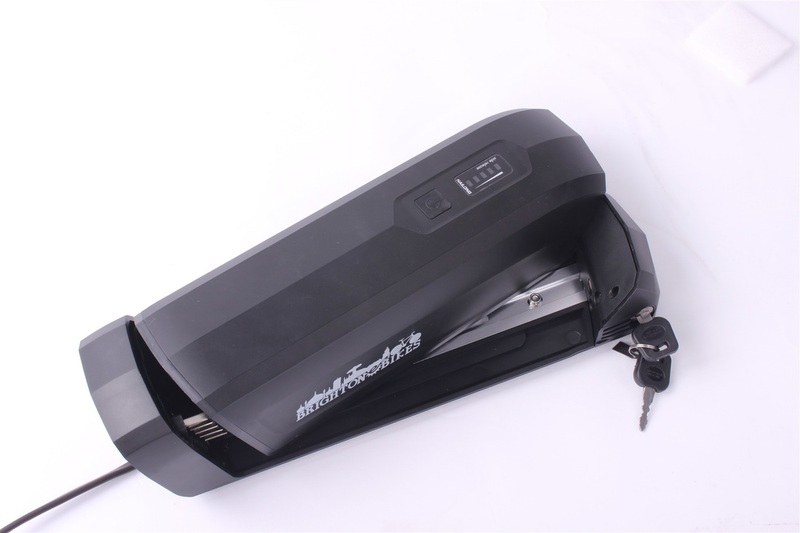 Some may see it as a little unorthodox, but in everyday life, if it works, then it works! 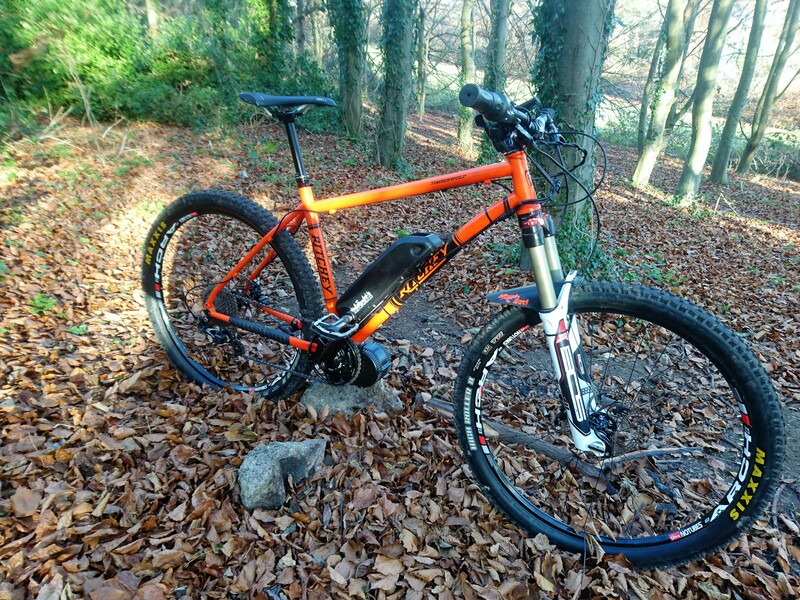 E-bikes, eMTB. What will the next 30 years bring..? An interesting and entertaining video clip from 1985, when snowboards were not as commonplace on the hills as they are today. I wonder what reports we will look back on in another 30 years from now, and simply have to laugh? I'd wager a few misconceptions about eMTBs will be amongst them. 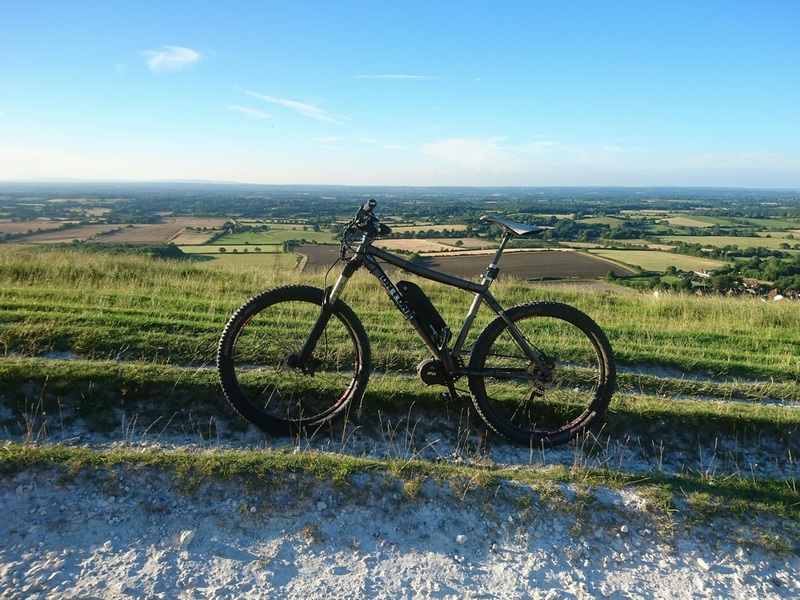 Sunny Days along the South Downs Way. 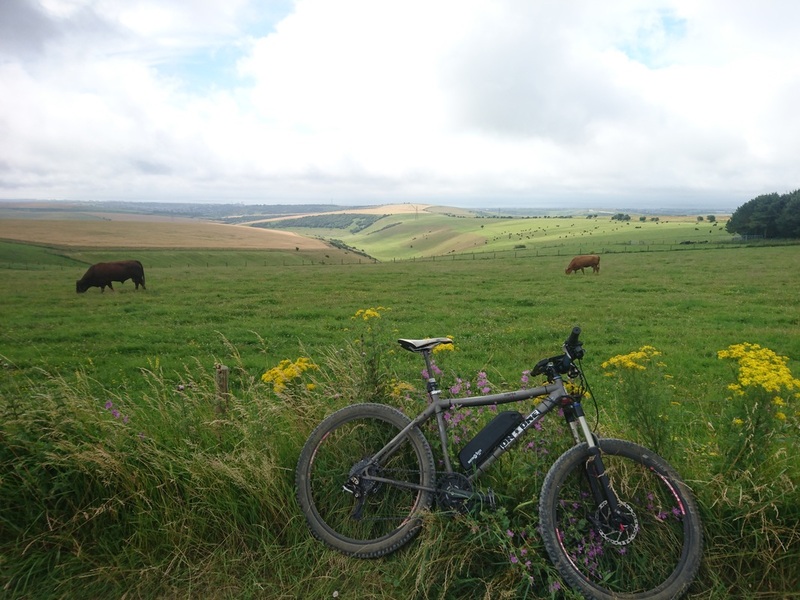 A few photos taken during a recent ride along the South Downs Way, brought together in a short video courtesy of my magical telephone computer thingy. 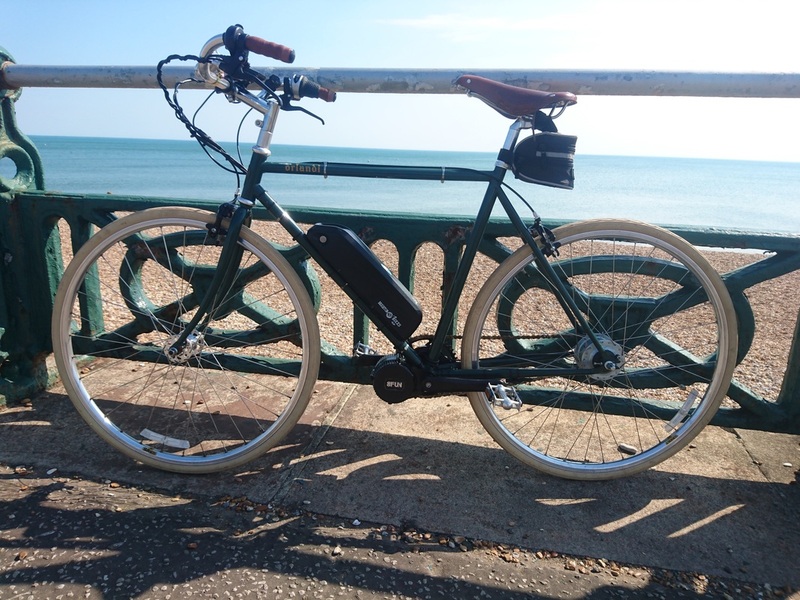 Brighton E-bikes, Brighton Marina﻿ to Saltdean. 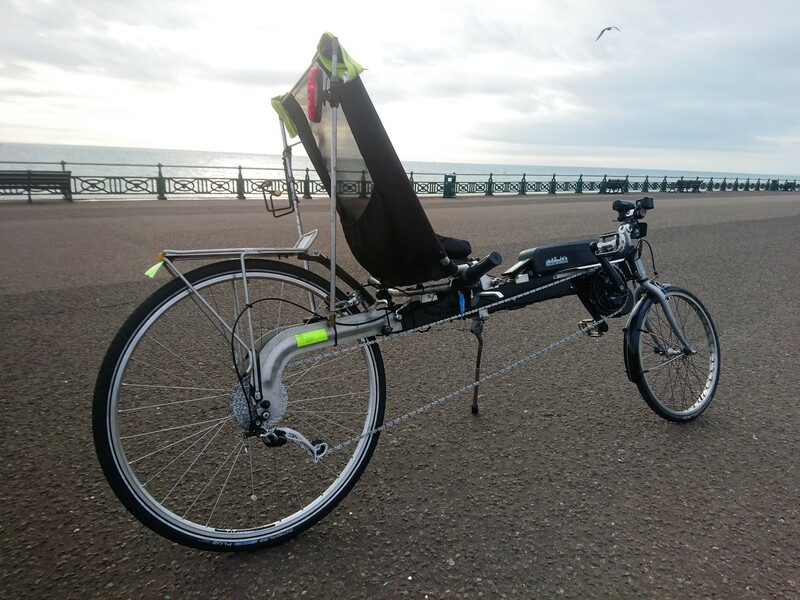 There really are some lovely rides to be had around Brighton. 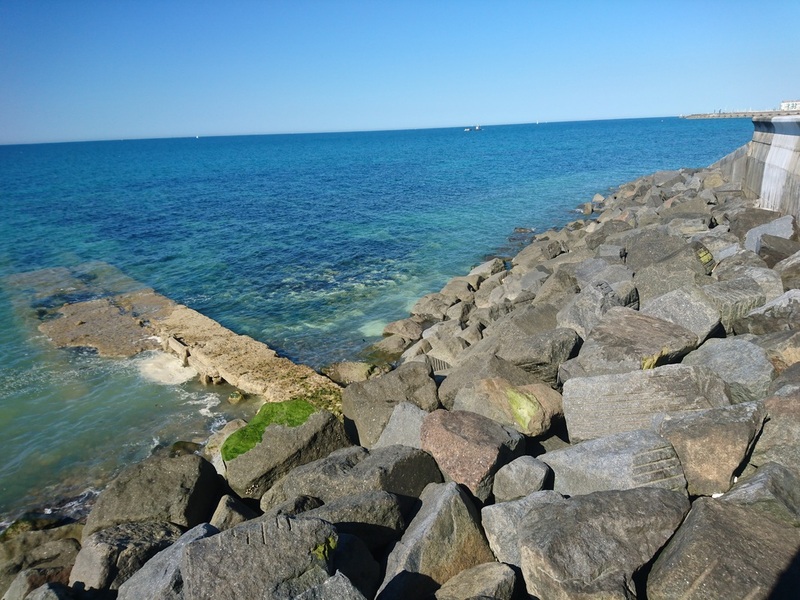 One very easy, accessible and flat route is along the under cliff path from Brighton Marina towards Saltdean. On a sunny day like today the views are just great and the sea breeze cools the air nicely. 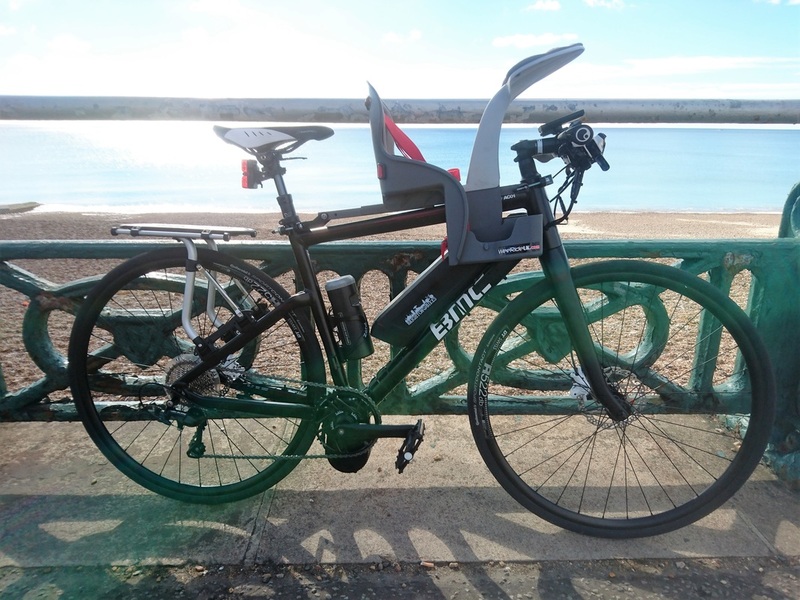 Here are a couple of photos taken on the ride overlooking the Marina and under cliff path as well as the view towards Brighton with the Pier in the distance. 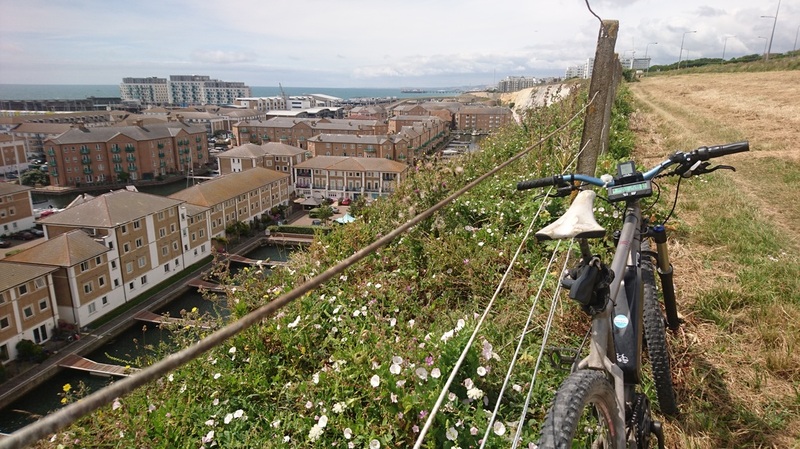 In the last photo, taken from above and overlooking the route, the cliffs in the distance are nearing Peacehaven at Telscombe Cliffs where the under cliff path ends, so it's a lovely manageable ride for all the family. 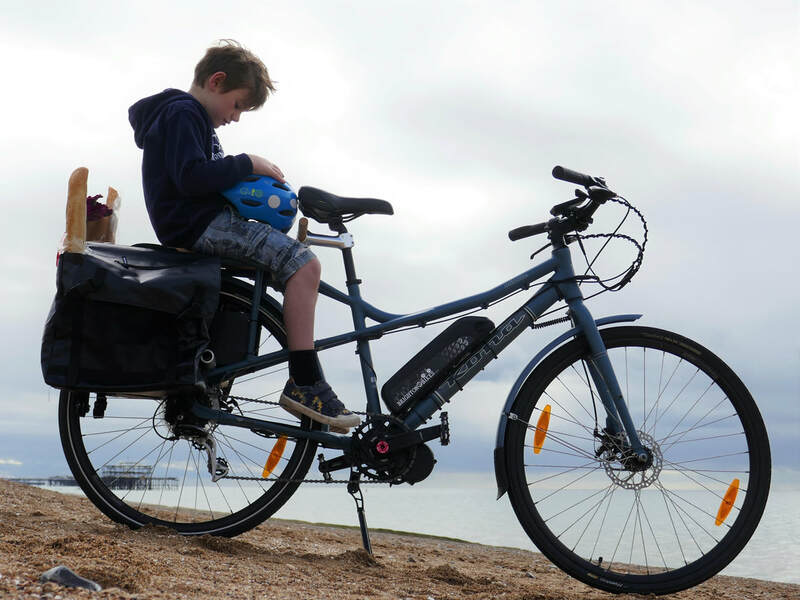 There are a few good cafes for refreshments along the way too. It's great to see how the wildlife, flora and fauna changes throughout the seasons, but it doesn't get much better than during the summer months. Above: View from up above Marina looking west towards Brighton Pier. Above: Panorama looking out to sea from above the Marina. Above: View from the under cliff path near Saltdean Lido looking west towards Brighton Marina. 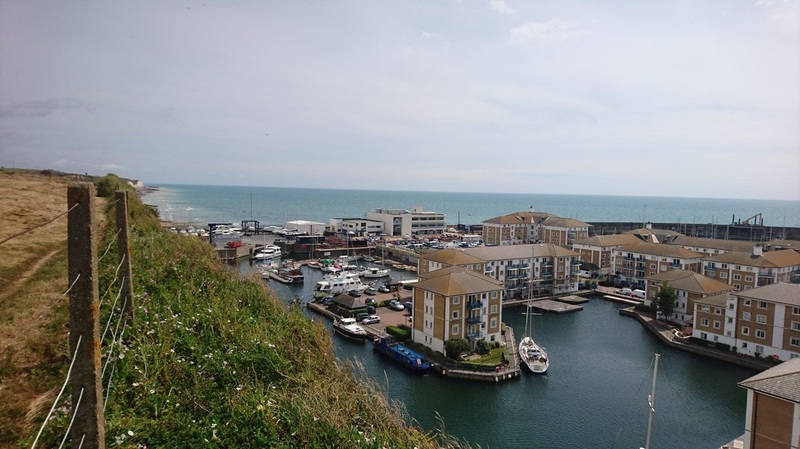 Above: View from up above the Marina looking east towards Saltdean. 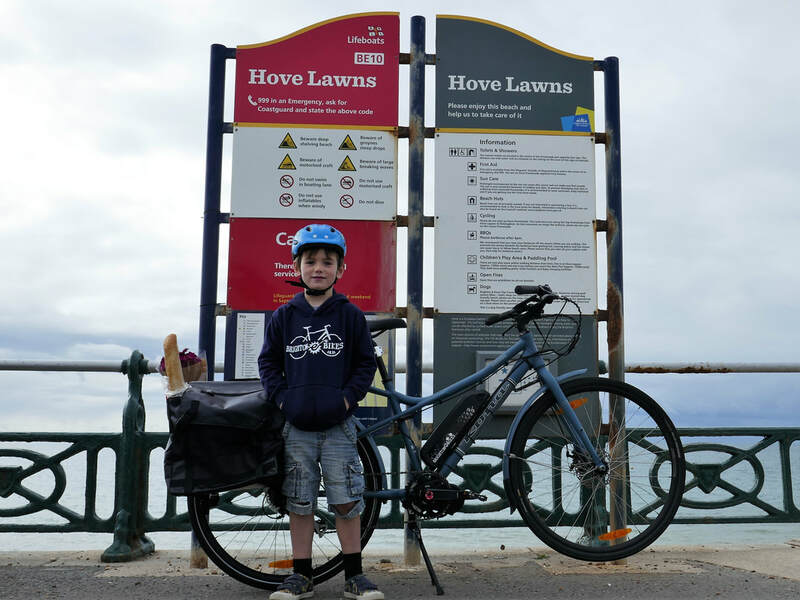 The map below shows the shared cycle path from the Marina out to Saltdean. ​Click on the Map to view in Google Maps. 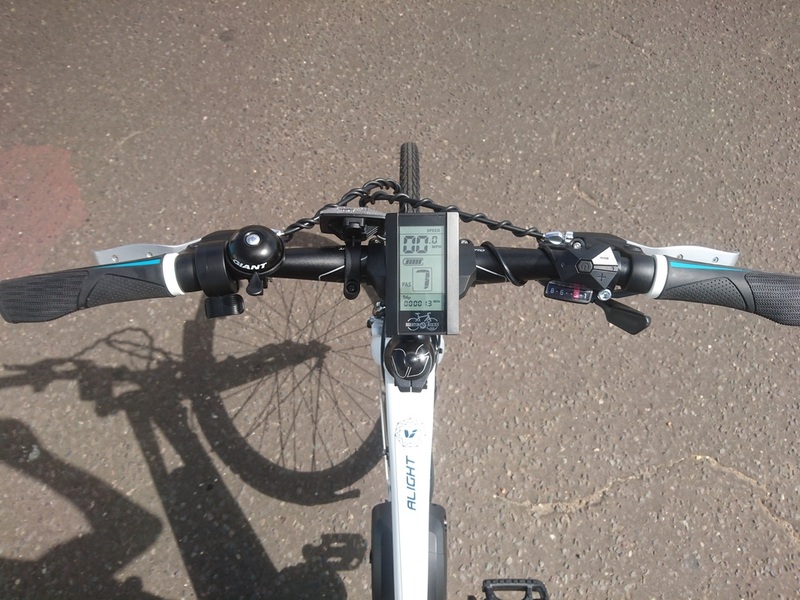 Above: A ten minute video riding towards the far end of the under cliff path. As if by magic, the hills appear to disappear! 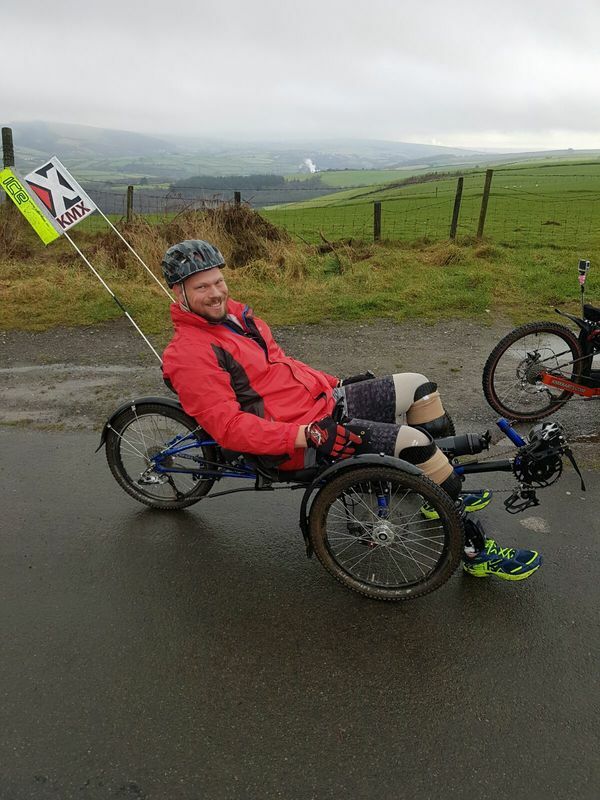 Unless for training purposes of building physical endurance for races and events, it's fair to say that pedaling uphill isn't a particularly pleasurable experience. 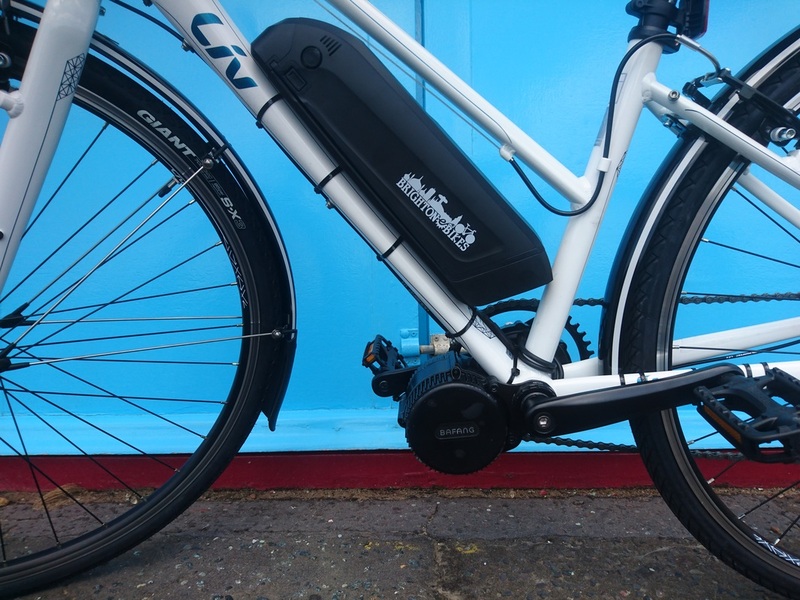 Whizzing downhill on the other hand, is very much fun. 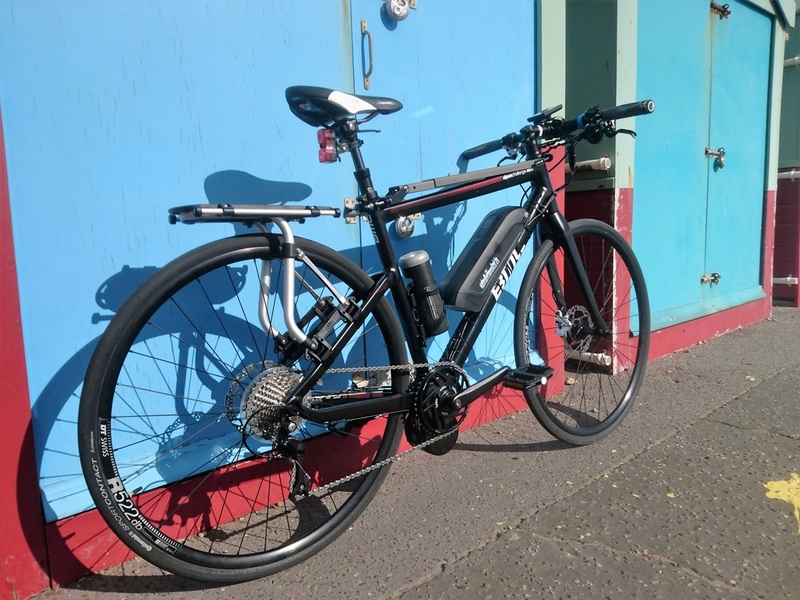 This is where more and more people are discovering the wonder of bikes with electric pedal assist. 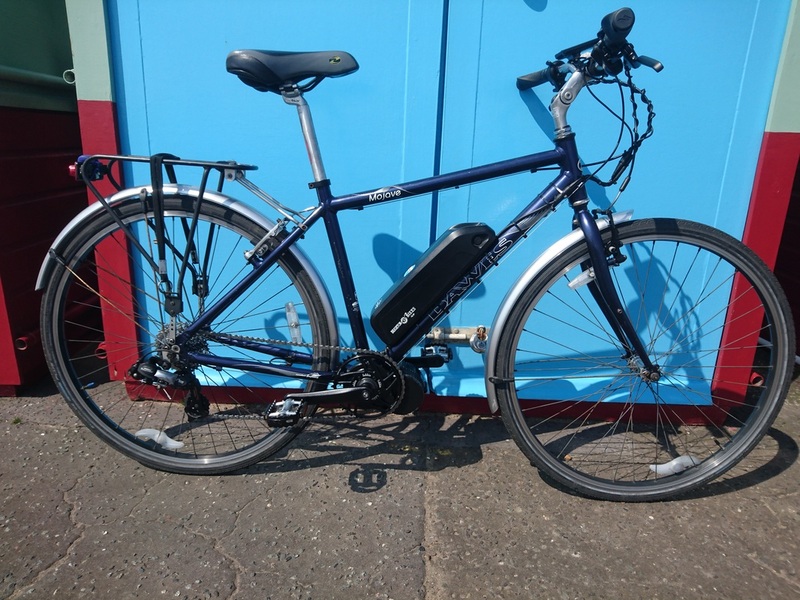 Used daily by a competitive athlete and runner, this recently converted Dawes Mojave now provides an efficient way to travel to training sessions without using up some all important power in the legs, meaning when the racing starts on the track, 100% is available from the start. 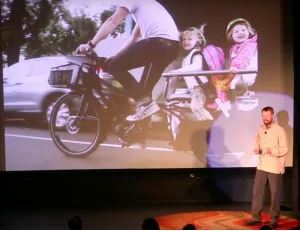 Arriving in an electric car, then tearing up San Fran. Rad! Discovering old friends can be even better than you remember them. 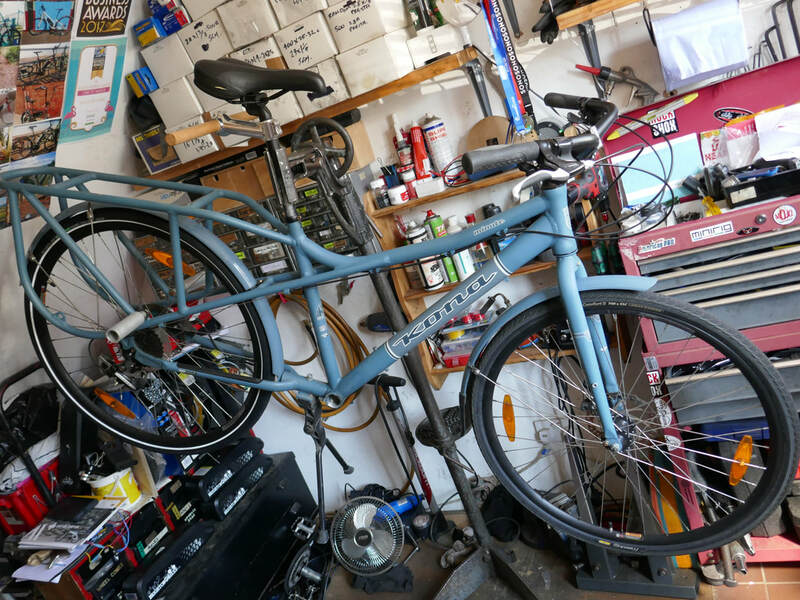 A much loved bike, bought brand new some twenty years ago and left chained up on Brighton seafront for six months in error, is back as a new and improved best buddy. The time spent chained up on the seafront taking the brunt of last winter's weather had taken it's toll. 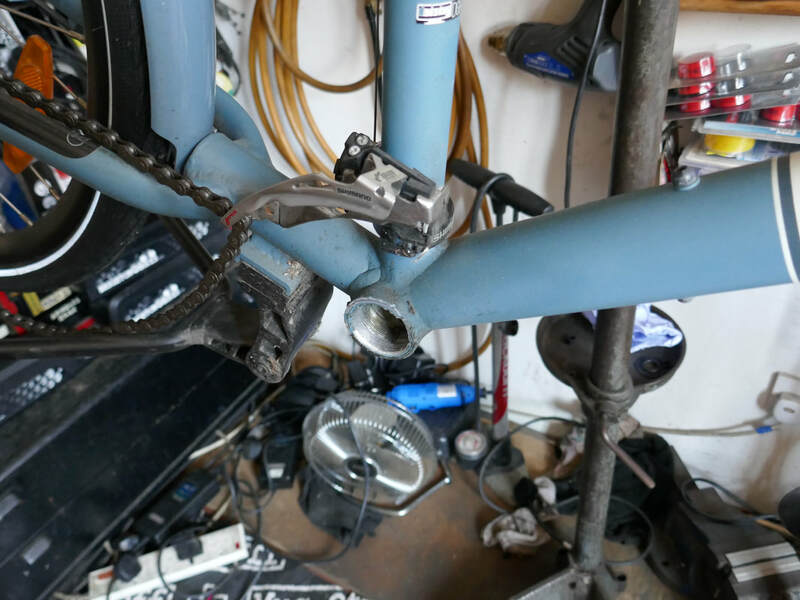 The chain was like a straight piece of solid brown metal, the brakes were seized solid, the derailleurs were fixed in one shape, it was a sorry sight. 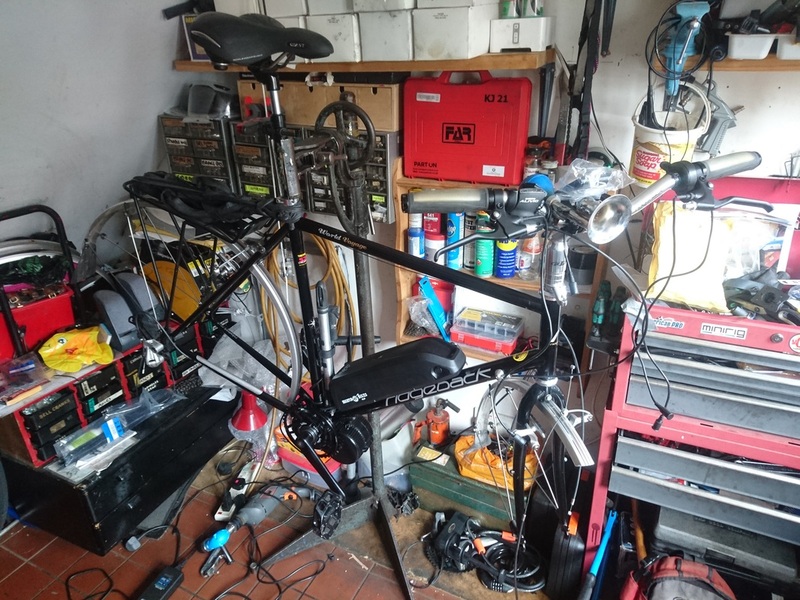 There was, however, still a lot of good bike remaining. 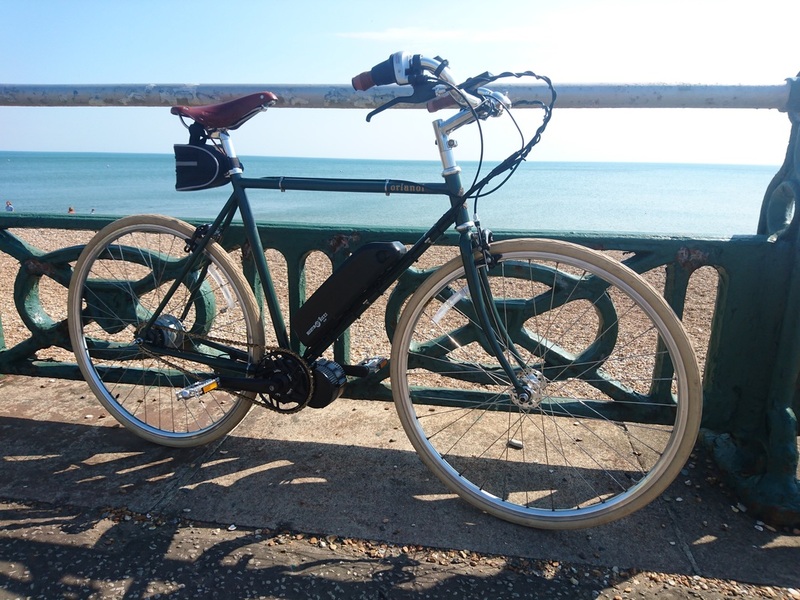 Some pampering was required and some modernisation requested, and that's when Brighton E-bikes got involved. 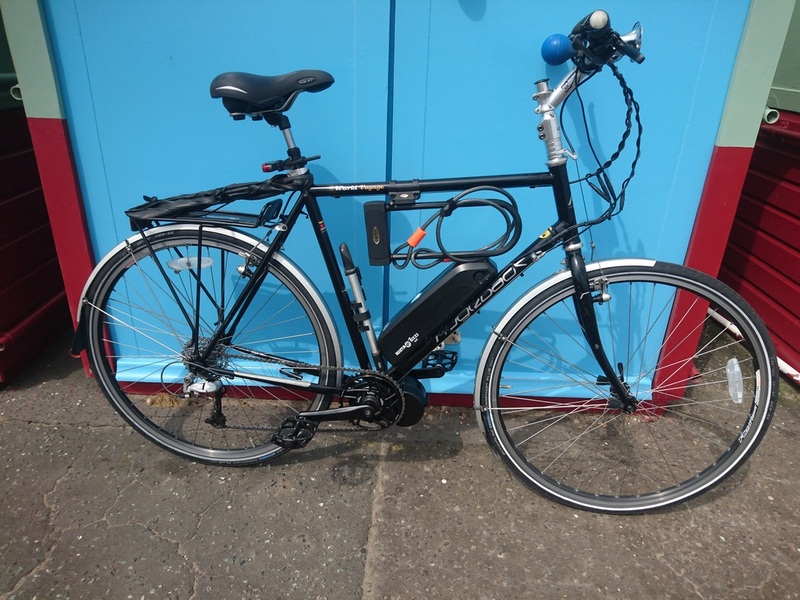 After a full strip down, rust treatment and a polish, new bearings with fresh grease were fitted all round, a Bafang BBS01 250 watt mid-drive motor and a Samsung Lithium-ion battery were added, and it is now like a new and improved reincarnation of it's former self for 2016 and beyond. 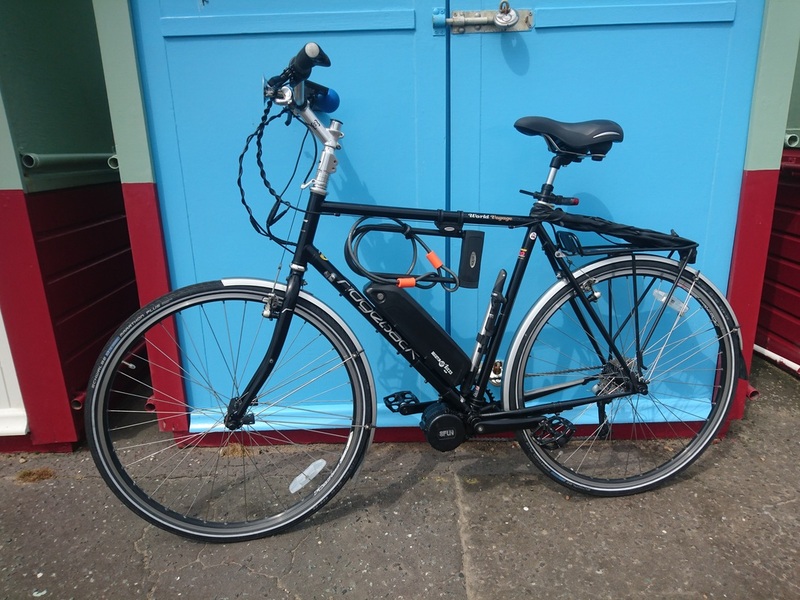 Back in use everyday for another decade or two, but now making Brighton feel as flat as Amsterdam, it's a great example of how to get More Smile per Mile.